The Affordable Care Act was aimed at the 36 million Americans who were not covered. It’s been reported that only a third of the uninsured are even registered to vote. In 2010 only about 40% of those registered to voted. So even if the uninsured kept with the rate which they likely didn’t, you would still only be talking about 5% of the electorate. To aim a huge change in mandate to such a small portion of the electorate made no political sense. So when Democrats focused on healthcare the average middle class person thought the Democrats are not paying enough attention. And Get This, The Failed ObamaCare. 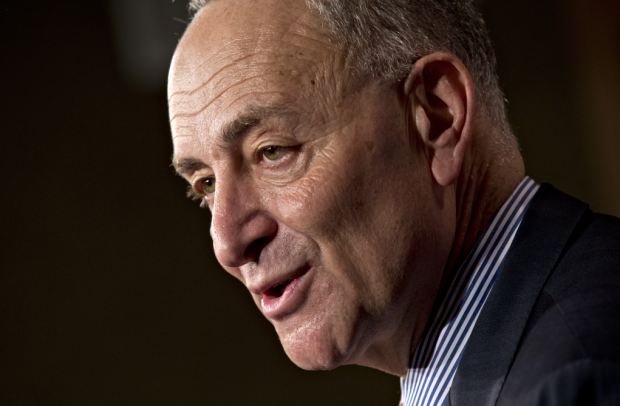 Senator Schumer has been around a long time and is a real politician, the kind Americans hate. Note in his talk the goal for Democrats is always to win the election via the electorate rather than doing what’s best for Americans. Democrats are great politicians in the way they focus on winning elections, no matter what has to be done. Unfortunately for America, they don’t give a damn about the American people. 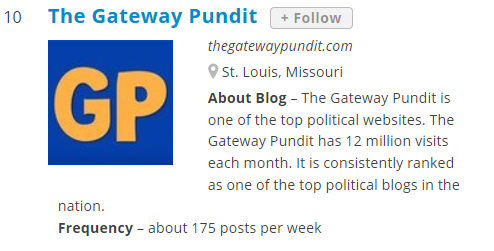 The Gateway Pundit Ranked in Top 10 Political Blogs and Websites on the Web! Congrats to my brother Jim! Feedspot came it with its list of Top 100 Political Blogs & Websites on the Web and the Gateway Pundit is listed in the Top 10! The GWP was ranked No. 10 on the list and one of the top conservative sites on the list. WORST PRESIDENT EVER: Obama Created ISIS!!! Trump said that President Obama and his Secretary of State, Hillary Clinton, created ISIS and he is right. Thanks to Judicial Watch, a 2012 defense intelligence report on the civil war in Syria openly states that the policy of the US and its allies was to support the Salafist opposition to the Syrian regime ran by president Bashar al-Assad. This opposition was spearheaded by Al Qaeda in Iraq (AQI) and the Islamic State of Iraq which soon morphed into ISIS. A leaked recording of Obama’s 2nd term Secretary of State, John Kerry, conversing with leaders of Syrian opposition groups reveals that Obama wanted ISIS to grow in order to serve the administration’s objective of ousting Syrian President Bashar Assad. It is hard to believe that just a few years after the US surge in Iraq, where Americans lost their lives to bring more relative peace to the nation than it had had in decades, that foolish Obama would pull all troops out of Iraq and then hand over weapons and support to al Qaeda/ISIS to fight Assad. Thousands of Yazidis and Iraqis were slaughtered by ISIS while Obama partied. Obama did not care nor did he take credit for the atrocities being his fault. The ISIS massacres will go down in history as the great Holocaust of the Obama years. Terror, bloodshed and death occurred on a daily basis while Obama did nothing to stop it. Obama created ISIS – the world’s most evil regime in decades. In late August WikiLeaks founder Julian Assange joined FOX and Friends to discuss the leaked Hillary Clinton emails. When pressed as to what was the most damaging email to date, Assange noted a stream of emails related to Hillary Clinton’s involvement in Libya. Assange stated that 1,700 emails were released related to Hillary’s involvement in Libya but perhaps none more damaging than the ‘Libya Tick Tock’ email or Hillary’s “internal brag sheet of how she was the person behind the Libyan catastrophe”. Hillary was President Obama’s Secretary of State at the time. The WikiLeaks the ‘tick tock’ email provides a list of all the actions that Hillary and the Obama team took credit for related to US involvement in Libya. The ‘tick tock’ emails show Obama’s Secretary of State, Hillary Clinton’s actions that led to Qadhafi’s toppling in Libya, including, but not limited to: suspending the operations of the Libyan embassy in Washington; evacuating US embassy personnel in Tripoli and closing the embassy there; obtaining sanctions against Qadhafi and his family; working to suspend Libya from the Human Rights Council; appointing Special Envoy Chris Stevens to be the U.S. representative to Benghazi; engaging with UAE, Qatar, and Jordan to seek their participation in coalition operations; holding meetings with House Democrats and Senate Republicans to persuade them not to de-fund the Libya operation; an lastly, Hillary’s State Department worked to construct a $1.5 billion assets package to the TNC. The Obama State Department takes credit for being the architect behind the overthrow of Qadhafi in Libya and the subsequent horror as a result. When Obama became President Qadhafi was complying with US inspectors being in his country. There was no reason to attack Libya at the time because they had done nothing to instigate actions by the US. But Obama and Clinton wanted to get Qadhafi and so through their efforts a Libyan War crystalized. One recent report noted that a Libyan peace deal was in the works after the war started but the Obama State Department didn’t want peace and so it was quashed. As a result the war went on and resulted in the eventual death of four Americans in Benghazi, including US Ambassador Chris Stevens. These Americans died due to Obama’s inaction when they called for help as terrorists were attacking them on 9-11 in 2012 as was famously portrayed in the movie 13 Hours. Obama and Clinton are also responsible for the thousands of violent Libyan deaths since their efforts to over throw Qadhafi. They are also responsible for the numerous atrocities in Libya over the past eight years. Today Libya is a quagmire and ISIS’s strongest branch outside the Middle East. Obama and Hillary had a chance for peace but instead they gave Libya to ISIS! Later sick Hillary joked about Qadhafi’s death in Libya. In September’s Commander in Chief forum Hillary had the gall to say that no one died in Libya! Obama and Hillary are complicit in the destruction of Libya and murder of thousands of Libyans along with four Americans. Libya is still a mess and a now an exporter of terror around the world. This is Obama’s Libyan legacy: death, destruction, lies and terror. CNN used a screen shot from a video game in their recent news report about Russian hacking allegations. CNN used a screenshot from the video game ‘Fallout 4’ to show how Russians hack things. In a recent story about President Obama proposing sanctions against Russia for its roll in cyberattacks targeting the United States, CNN grabbed a screenshot of the hacking mini-game from the extremely popular RPG Fallout 4. First spotted by Reddit, the screenshot shows the menacing neon green letters that gamers will instantly recognize as being from the game. In his first 6 years in office, Obama broke the world record for largest annual deficits accumulated under a President of any country ever. He went from $1.4 trillion in 2009, to $1.3 trillion in 2010, to $1.3 trillion in 2011 to $1.1 trillion in 2012, to $0.7 trillion in 2013 to $0.5 trillion in 2014. No other president has surpassed $0.5 trillion in a single year. George W Bush incurred $5 trillion in national debt over 8 years (which included 911, wars in Iraq and Afghanistan and the 2008 recession) but Obama matched Bush’s debt in his first 4 years in office alone. As the US continues to increase its debt and with rising interest rates, the portion of the federal budget spent on interest will drastically increase. Rates are very low now but even slight increases will increase the US debt interest payments significantly. The $20 trillion in debt also does not include the more than $100 trillion in estimated unfunded liabilities related to these social programs and government employee pensions. For once, Hillary was right. The US’s involvement in Syria under Obama is nothing short of a nightmare. This was not the case in early 2009 when Obama was sworn in as President. Today US-backed and armed Syrian groups are fighting other US-backed groups because the Obama White House stirred up war in Syria but then lost control in the process. According to Eric Margolis via Strategic-Culture.org, because of the Obama Administration’s astounding incompetence the US military decided to support its own rebel groups and the CIA did the same. As would be expected, fighting soon erupted between the US backed groups which no one could keep track of. Ultimately, Obama’s plan in Syria included the US, Saudi Arabia and Turkey arming and financing ISIS to attack Syria. As a result 450,000 Syrians are dead and at least half of the 23 million have become refugees. Because ISIS went rogue the US turned to the Kurds to assist who were then attacked by US ally Turkey. Russia next entered the mess and supported Bashar Assad, the leader of Syria. Predictably Russia attacked US backed groups while claiming to attack ISIS. To address the Syrian mess that Obama and his Secretary of State, Hillary Clinton created, Obama decided to bring US troops back to Iraq to help clean up the mess. In a recent speech by Obama about the disaster in Syria, Obama indicated that the mess is not the fault of the US and other outsiders, who imported jihadis and even weapons from Libya to overthrow Syrian president Assad. Obama believes the mess is Assad’s fault for resisting the foreign-backed overthrow of his government. Obama and Hillary gave arms to al-Qaeda in Syria who morphed into ISIS. The US military and CIA believing Obama and Hillary were incompetent started funding their own groups. Everybody started killing everybody including heads being cut off. People that survived became refugees some of which include ISIS. Obama brought US troops to Syria to clean up his mess and then brought Syrian refugees, including ISIS, to the US to get them out of the mess. Russia and the US are bombing opposing sides. WORST PRESIDENT EVER: Obama’s Signature Bill – Obamacare – Is a Disaster! 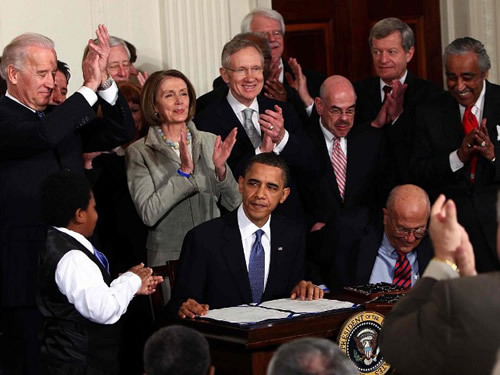 Obamacare is the more familiar term given to the Patient Protection and Affordable Care Act promoted and eventually signed into law by President Obama in 2010. It was controversial from the start. In the middle of one of the worst recessions in US history, Obama and his Democratic Congress proposed the 2,000 page piece of legislation that overhauled the world’s best health care system. The bill was eventually passed in a manner never used before for a bill this size leading many to say it never really was passed. When it went to Supreme Court, new Justice Kagan never recused herself. She had been involved in the legislation prior to becoming a Supreme Court Justice and in any other situation a person of integrity would have recused herself, but not Kagan, her vote was needed to keep Obamacare alive. The bill would never have made it through the Supreme Court without her vote. Ultimately the Supreme Court ruled that Americans could be forced to purchase something and in this case it was insurance. The Obama administration argued that this was a tax, something they said it wasn’t to get Obamacare passed. Justice Scalia said that the court with their decision could now force Americans to buy broccoli. In response to the ridiculous and scandalous decision Scalia referred to the logic from the supporting Justices as ‘jiggery pokery’. the Obama administration went through “tortuous” measures to keep the facts about the legislation from the American people, including covering up the redistribution of wealth from the healthy to the sick in the legislation that Obamacare is in fact a tax. What an absolute mess Obamacare is. Young Americans have to pay huge tax penalties if they don’t choose to obtain incredibly expensive healthcare plans. The penalties can be thousands of dollars for low income earners. The coverage is terrible, the premiums are high, the deductibles are high and everyone hates it. Obama is meeting with Democrat Leaders from the House and Senate this week to discuss saving Obamacare but it probably won’t matter as incoming President Donald Trump has promised to get rid of the program. Obamacare started with lies, lies kept it going and it is still one big lie. Anything so dishonest cannot be good! In June of 2016 Obama’s own US State Department reported that Iran is still the leading terrorist state in the world. It is killing more people than ever before. Obama’s deal with Iran was maybe the worst foreign policy action ever taken by a US President ever. As the year comes to an end, we’ve put together a list of the 10 most memorable lines from the 2016 Presidential campaign. 2016 is a year we will never forget. 10. Hillary Clinton said right after having some sort of seizure during a campaign stop, “You guys have got to try the cold chai!” This was one of the many oddities that led to concerns about her health. Clearly there was more to this than her cold chai tea. 9. Donald Trump later gave a speech in Florida and commented about Hillary’s Health. [Hillary] gives a 10 minute speech and then “Go[es] back home and go[es] to sleep”. 8. During the Republican debates Trump coined the term “Lying Ted” Cruz to describe his fellow Republican running for President and he wasn’t scared to say this during the debates. 7. During a Republican debate, Governor Jeb Bush was falling in the polls and Donald Trump let him have it, saying he was “real tough”. It was soon over for Bush. 6. With only a few months before the election, Hillary Clinton posed a question in a video conference call with supporters, “Why aren’t I 50 points ahead, you might ask?” At this exact moment it became clear why she was not 50 points ahead and why she was going to lose – along with being a criminal, she was officially off the charts crazy.